If you are growing daylilies in Australia, you may as well look for the best, and Daylily ‘Cranberry Baby’ is certainly one of these. This is a dwarf variety, however only in height, the flowers are large, slightly ruffled, velvety and cranberry pink coloured. You can add in a yellow throat for contrast. 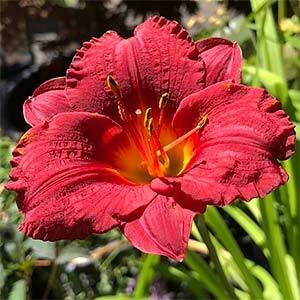 This is repeat flowering like all daylilies and very easy care in the garden or container. As this is a lower growing variety it is suited to container growing. It will grow well in full sun to a afternoon shade. Although tolerant of a range of soils, best growth will be in a humus rich well drained soil. Try growing near the front of the border so the flowers of this lower growing variety are more easily on display. Flowering time – Summer to autumn – repeat flowering. Height – To .3 metre (12 inches). Pruning – Not required. It can be pruned back a little after flowering is completed.